There is little that sets the LTTE and TNA apart. The objectives of both remain the same only the modus operandi differed. The Sri Lankan Armed Forces eliminated the ground terror of LTTE removing the terrorist aspect from the quest. Now the TNA has taken over the baton with the objective well on track. The world and Tamils conveniently forget that LTTE launched its campaign by killing their own Tamil people FIRST while Tamil parliamentarians simply watched. Our issue is that while LTTE is designated as a terrorist organization and remains proscribed even 4 years after its demise, the TNA are voted parliamentarians so what business does the TNA have to continuously fly overseas (8-12 August 2013) to meet pro-LTTE lobbies under the very eyes of the Canadian Government whose decision to attend CHOGM is decided by the lobbying tactics of Canadian Tamil votebase ridiculing the integrity of some Canadian parliamentarians. TNA next transited to the US where its State Dept presumably do not “talk” to terrorists but “discusses” options of piggybanking on the separatist agenda for it works perfectly with their plans to destabilize Sri Lanka and the Asian region “”…” a coup d’ƒÆ’†’©tat within a coup d’ƒÆ’†’©tat? It is high time the Sri Lankan Government read out the 6th amendment to the TNA. For years we have been living amidst lies. It was during British rule that Tamils first created a mono-ethnic political party for Tamils eliminating the supposed Sinhala discrimination, it was immediately after independence that Tamils formed a bogus “federal” party to hide its Tamil meaning for separate statehood (what federalism was required immediately after independence) and Tamils hijacked to perfection the 1956 Sinhala Only policy for when Tamil was never used in official matters or State administration where was the discrimination and when the supposed Tamils claiming discrimination were all English educated elite probably not even speaking Tamil in their homes! Standardization was opposed because elite Tamils did not want their own lowcaste Tamils to obtain university education. They did not want their own lowcaste Tamils to attend schools or kovils either and that is why the elite Tamils opposed the Prevention of Social Disabilities Act of 1957. That elite Tamils began to agitate in 1957 after the Act and not 1956 against the supposed Sinhala Only policy shows the Tamil cunning because what type of Tamils would write to Britain asking them to encode caste into legislative enactments and objected to the seating directive for previously even after allowing lowcaste Tamils to study in schools and enter kovils “”…” these children had to sit on the floor. Now TNA’s nominee Wigneswaran joins a coterie that claims to want an exclusive Tamil Homeland to look after their own “”…” when they historically objected to their own people getting education and even entering kovils!!! We wonder whether the Resolutions of Vaddukodai by the TULF and the calls for Tamil Eelam is really meant to go back to times where the elite can once more rule over the low-castes and now question how far Sri Lanka’s Tamils wish to continue to be manipulated and monopolized by their own community now that they are also educated and possessing wealth? The TNA that sat silent for decades as LTTE enforced its own judicial system, banking, education, state functions, naval and air force, health services, civil police force, “human rights”, radio stations, television stations issuing its own stamps, coins and now its gearing into action to take over from where LTTE left off. The TNA was voted into parliament by the LTTE facilitating its election victory and if Sambanthan claims to have also been under LTTE radar it was only because LTTE would not tolerate any TNA member going against its creed which TNA was well aware of. Sivanesan, Joseph Pararajasingham and Raviraj as well as Amirthalingam and over 200 other learned Tamils put to death by LTTE was enough to keep Tamils under fear psychosis including the TNA if it attempted to over-step LTTE goals. The same fear scenario prevailed even amongst the Tamil Diaspora which is why the utopian in the sky transnational government of Tamil Eelam was formed in 2010 after Prabakaran’s demise. TGTE would never have been formed had LTTE or Prabakaran been alive. So now a host of Tamil groups forming themselves AFTER LTTE collapse are carrying on the same separatist agenda for that is where the cash, perks and political power lie for THEMSELVES. TNA gearing into action post-LTTE defeat exposes its cunning and it is high time the majority Tamils wake up to break away from becoming a pawn for a second wave of calamities. It is time that Tamils now ask themselves whether they are to continue to align with TNA’s separatist agenda visible in its election manifestos. No Tamil can claim to wish to live as Sri Lankans if they vote for a party that desires to create a Tamil Homeland with territorial integrity, inalienable right to self-determination of a Tamil Nation. No Tamil should forget that the Sri Lankan Armed forces sacrificed their lives to save 195,000 Tamil civilians and it is they who must oppose the present calls for the removal of the armed forces from the North. Did the armed forces ever treat Tamils as the LTTE had during the height of its defacto rule? TNA was living in Colombo protected by Sinhala guards, Colombo Tamils feared to travel to the North so both these entities have no right to be talking on behalf of the Tamils who were living and suffering amongst the LTTE. TGTE thinks it can create a government in the sky and then lobby foreign governments to draw fictitious boundaries in Sri Lanka when Tamils in Sri Lanka does not know what TGTE stands for, what its leader looks like or probably haven’t even heard of TGTE though foreign governments think otherwise. How many Tamils have also heard of the Democratic Norwegian Council of Eelam Tamils, or the Swiss Council of Eelam Tamils, Maison du Tamil Eelam, National Council of Canadian Tamils though the British Tamil Forum, the Global Tamil Forum as well as the Tamil Youth Organization are regularly having links and deals with foreign parliamentarians and heads of international organizations. It is within this same club of conspirators that notorious entities have been caught and found guilty of sponsoring terror and fundraising on behalf of terror. It is amongst this same club gathering that the TNA finds friendships and travels miles to deliver speeches and addresses its memberships. What would any Government or nation have to say about parliamentarians delivering speeches or addressing groups that are associated with terror, that help fund terror, raised sponsorships for terror, helped buy arms and ammunition to kill innocent people and manipulated the weaknesses of integrity-less foreign parliamentarians ever ready to use their office to acknowledge and promote them through their Governments? When Shanthan is affiliated to the United Tamil Organization, International Federation of Tamils, Action Group of Tamil Asylum Seekers “”…” all front organizations in the UK what business does the TNA have with him and these organizations? A question also posed to the TNA is what sponsorship shopping was its 2 leaders Sambanthan and Sumanthiran indulging in Canada as well as holding talks with US State Department just days ahead of Navi Pillay “”…” UNHRC heads arrival in Sri Lanka and the Northern Provincial elections as well as ahead of CHOGM an event that Sri Lanka was naƒÆ’†’¯ve enough to fall for without questioning why a former colony should celebrate the colonial atrocities of the British and organizers have humiliated the nation further by pulling a discarded Queen Victoria to polish! 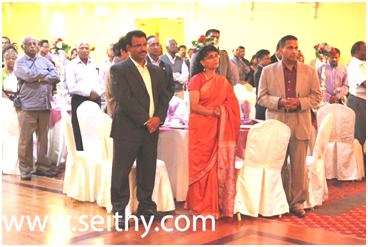 This is not the first or probably the last time that the TNA has flown to Canada and delivered speeches on behalf of pro-LTTE organizations openly raising funds in these foreign nations under the very eyes of foreign Governments who preach one thing and practice something else. When foreign governments in their own letterheads describe TNA as a pro-LTTE political party is there anything else we need to elaborate on? 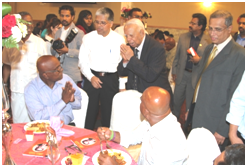 When TNA leaders Sambanthan and Sumanthiran are hosted for dinner at 90 Nolan Cort, Jasmin Banquet hall, Scaborough, Toronto where the gathering including representatives of National Council of Canadian Tamils, Canadian Tamil Congress, Transnational Government of Tamil Eelam, Tamil Lawyers Association, Canadian Tamil Traders Union and other Tamil organizations all working for a separate state would the TNA speeches have been asking other than echoing the same separatist sentiments? 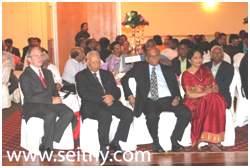 Tamil Eelam “”…” Is it for the Diaspora living happily as foreign citizens? What foreign passport holders would want to create a separate Tamil nation to which they are unlikely to come and reside? Are Tamils in Sri Lanka naƒÆ’†’¯ve to not wonder for what reasons they are making separatist calls that only contribute towards distrust amongst the rest of the communities? Would a country knowing what it was like to live with terror not fear that the present calls for separatism no different to what the LTTE made may again lead to taking their freedom away from them? Do Tamils now living happily, those able to travel freely want their people to contribute to the disunity and continue to divide people while they are happily living in foreign climes? These are questions that Tamils living in Colombo, the North, the East and throughout Sri Lanka should seriously ponder over. It is in the hands of the Tamils to put their foot down and say no more “”…” the Tamils were kept silent by the gun but today there is no gun to silence them so it behoves Tamils to ensure that the Diaspora elements are not allowed to dictate how they live through remote controlling from overseas “”…” Tamils in Sri Lanka deserve far better treatment for it is they who suffered while the Diaspora were enjoying life using the LTTE kitty. For far too long the TNA has misled the Tamil people and contributed towards the disunity of the nation. They stand guilty of using parliamentary privileges to hide behind their separatist goals for which they have openly aligned with pro-LTTE groups. Foreign Governments have themselves described the TNA as a pro-LTTE organization and sufficient evidence prevails to prove so. The election manifesto of the TNA suffices to prove that the TNA is seeking the same objective as the LTTE and that is a violation of Sri Lanka’s Constitution. If the TNA has been violating Sri Lanka’s Constitution what have Sri Lanka’s Governments done about it? The public do not wish to be pawns of another calamity because Sri Lanka’s Governments want to end up in the good books of foreign governments that are pressing buttons to upstage them from political power. It is the welfare of the country that must take center stage and not the political future of politicians. Therefore, it is time that the TNA was read out the provisions of Sri Lanka’s Constitution under the 6th Amendment, Article 157A specifically prohibits any violation of Sri Lanka’s territorial integrity. Article 157 (3) says that ANY person who acts in contravention of the provisions of paragraph (1) shall, on conviction by the Court of Appeal, after trial on indictment and according to such procedure as may be prescribed by law “”…” face the following consequences as punishment. Moreover under the Seventh Schedule to Article 157A and Article 161 (d) (iii) an oath of allegiance to the Sri Lankan State is required to be taken. The TULF walked out in 1983 refusing to take the oath and Anandasangaree walked out with them, this was the same Anandasangaree who wrote that the “ TNA, as the first and the worst enemy of the Tamil People. They should take full responsibility, among many other matters, for the loss of several thousands of lives and for causing injuries for many more.“¦. All have become paupers now. They will find hardly anything left when they return to their homes one day. All these or atleast 90 % of these could have been saved and total displacement could have been avoided if only the TNA had the forethought to advise the LTTE to release the people from their grip, to go anywhere they liked. The TNA is blamed for this because, when everyone, every organization, every country, the EU, the UN etc. had made this request specifically, only the TNA kept on asking for the war to stop. When the 8000 students who sat for the G.C.E(O/L) exam were taken away for compulsory training by the LTTE the TNA kept mum. Some of them are now dead and others are under detention by the Government. Where are the children and grand-children of the TNA MPs. Will the TNA at least now tell the world as to what happened to the students at Sencholai. “¦. “Who are these gentleman of the TNA now wanting to form an alliance with the DTNA. They are the people whom the LTTE elected to represent them in parliament fraudulently and it is they who unashamedly claimed the LTTE as the sole representatives of the people. The LTTE is no more and hence they do not need any representation in Parliament. Under the Present circumstances the most honourable action the TNA can take or must do is to quit parliament without clinging on to that office. Neither the PLOTE nor the EPRLF (Pathmanabha) gave any indication to Mr. Srikantha who met me by appointment and the other two by accident. As for me I will not touch the TNA even with a “pole”. The dead, the injured and those living in the IDP camps deprived of all their rights will not pardon us if we have any deal with them. The TNA should not under-estimate our alliance partners who cannot be bought over with a mayor-ship or with any membership in Parliament as they sold themselves in April 2004. “¦. “For five years I fought a lone battle, amidst threat to my life, unbearable humiliations etc. I was also christened as a “traitor”. I now feel exonerated. Let the souls of the dead haunting our homes bless me and not curse me.” Now the man who officially issued the above statement in 2009 has decided to put his eggs with the TNA. What else is there for us to say? It is time to read to the TNA Sri Lanka’s 6th Amendment “”…” it is time to get ALL MPs to read out the Oath of Allegiance as well as for of Sri Lanka’s citizenry to take a similar oath. We must guard and protect the sovereignty and territorial integrity of our nation “”…” it is a country that all the communities must live in without the threats of terror, incursions or foreign invasions of whatever kind. Legal action alone will NOT work. People should take SOME MATTERS into their own hands and NIP the dirt in the bud. We must finance these people. “Three persons, including a female, have been injured and hospitalized following a shooting which had taken place inside the SLAF Resort in Marble Beach, Trincomalee. The shooting was carried out by a Corporal of the Sri Lanka Air Force who had shot the female, a receptionist at the resort, before turning the gun on himself. Another male who was at the reception of the guesthouse at the time of the shooting has also suffered injuries. All three of them have been admitted of the Trincomalee Hospital, Air Force Media spokesman Air Commodore Andrew Wijesuriya said. Why can’t he shoot TNA terrorists and then shoot himself? Those who feel SUICIDAL must use it for a GOOD CAUSE – getting rid of terrorists. Then they will be remembered with love forever. A very well researched, accurate analysis of the TNA and what it represents. Lies, a quest for Eelam using cunning and subterfuge from where the LTTE left off! Legal Action a forthright necessity as they need to be ousted or forced to quit. Their clout is mainly through Diaspora support. They need to be clouted into oblivion and chased out of the politiical infrastructure.It is mind boggling that they are tolerated as a political entity when the term should be insignificant albeit dangerous non-entity. How the Administration has been hoodwinked into accepting them as the sole representative of the Tamils is truly mind boggling.If their continued tolerance is some kind of incomprehensible trump card the Administration might have in mind it is bound to backfire.This item pellucidates an important aspect which needs greater emphasis that they in their present guise do not belong in Sri Lanka on the foremost rationale that they were first an LTTE front emboldened later to openly support them.They have not changed their pro -Tiger stripes whatsoever beyond falsified rhetoric and if the Administration continues in an almost blinkered perspective to overlook this, a severe price could be paid by the proplr of Sri Lanka and huge reprisals could ensue. They are a threat to National Secutiry, Sovereignity,Territorial Integrity and an affront to all decent, freedom loving Sri Lankans inclusing the Tamils. The part about taking an oath of allegiance to the Constitution absolutely imperative and brilliantly deduced while also need to denounce their affiliations to the separatist ideals and objectives which become quite apparent if one reads between the lines of their continued manifesto. TNA is a shameless unregistered political entity undermining the very country that pays their MPs monthly pay, perks and pensions. They are trying to solve the problem of Tamil Caste issues of Tamil Nadu plus play up to foreign sources for Eelam. It all started with trumped up 1983 Riots during the Cold War and JR going westward against regional security of the Sov.Union. Now matters have changed and the Cold War finished (1946-1991). Why are we still dithering and allowing such Separatist nonsense when the Tamil community is relatively well off in Sri Lanka ? As a Nation we ought to get rid of the 13-A which gives life to Separatism. Can we trust India in this dilemma ? Alfred Duraiappa was killed in 1975. Vada-kundi resolution for war was passed in 1976. Sinhalese were chased out of Jaffna in 1977. In July 1983 AFTER the riots, govt. passed the 6 amendment and BANNED Tamil racists (ITAK = TULF) in parliament. 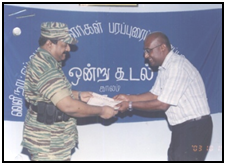 A violent TNA was brought back by the LTTE in 2000 making Sambandan its leader. I agree with you that the Tamil SEPARATIST DEMANDS & actions started a long time ago, but it was worst in the trumped up 1983 Riots. Shaming and downgrading the whole of Lanka ABROAD through lies, cheat & deceit started AFTER trumped up1983. Anger the local population with Separatist demands > have some sort of riots, some killings, some self inflicted damage > shame Lanka into giving more and more concessions > leading to Eelam. Shaming & downgrading their own Motherland Lanka (is it ? ), is the name of the game. When will it end ? ‘TRUTH wins’ says the Indian flag. Truth/God/Allah all mean the same thing. The Scriptures say : Fear thy Lord, thy God. The Tsunami that swept away the Sea Tiger might and some ltte VIPs was an Act of God. I partly disagree on 1983. SL was NOT framed by the international community over 1983! The world is NOT a fair place. It is UNFAIR. We have to play by that to SURVIVE and REDUCE competition. I AGREE 2004 tsunami was a g~d send. But G~d helps those who help themselves!! Look what we did after the tsunami. We DENIED aid to Tamil civilians and the LTTE forcing doom on them. We went hunting and killing LTTE leaders. We attacked tsunami affected areas FIRST when war started. G~d only gave us an opportunity but we grabbed it with both hands. Which VERSION of the truth that wins? Truth has versions. e.g. Someone’s version of the truth in 1983 – Chingalams killed Tamilians. e.g. MY version of the truth in 1983 – Tamils killed Tamils. So which version of the truth will win? It is up to US (we) to win the version that BEST suits us. Tamil propaganda for a separate state ABROAD IN THE WEST started seriously only after the 1983 Riots. These Riots were filmed and shown abroad. Sinhela people were drugged and dressed up in the old ‘dolawa carrier style’ with a white jatawa and white tucked up sarong, carrying a long wooden pole. I and my family saw them. This dress up was to show the ‘Sinhela people’ as attackers of Tamils. The Tamil attackers in the Riots were not dressed up to show their ‘Tamilness’. Drugs were freely available at the Nugegoda market place for as little as 25-75 cts. Yes, it was a well planned affair. The films were shown in the West by then Ambassadors (all Tamils). Luxmi Naganathan (Bonn, Germany), Moorthy (London, UK), and Balachandran (Paris, France). The WEST got involved in the so called ‘Tamil struggle’ only after the 1983 Riots. (1) Less Tamil language & Tamil Labor. (2) Use of English as a link language. (3) Deport all illegal migrants. (4) Become Self Sufficient as far as is possible. (5) Maintain cordial relations with all countries as much as is possible. e.g. In 1956 Tamilians wrote to Soulberry and complained about the “Sinhala Only” act. e.g. Tamils in the UK in 1960s were responsible for raising money for Tamil terrorist groups. But the bigger problem is NOT that. More than 90% of Tamils ALWAYS lived outside SL. What happened was Endia (along with TN) joined the west in the past 20 years then 70 million Tamils became part of the west camp. UNTIL then the west supported SL against Tamils 1983 or 1977 or 1958. THAT was when all this nonsense became a BIG problem. 1983 or not Tamil Madu would have 70 million Tamilians. 1983 or not Endia (with TN) would have joined west after their husband (Soviets) died of impotency and Endia became a horny widow. Before that the west NEVER took war crimes, etc. allegations seriously. 1983 killed more civilians than 2009 but NOT EVEN NOW the west demands ANY investigation into 1983!!! There is NO need. IF we are going to win the propaganda war, we should STOP blaming SL. IF we don’t believe in SL, NO ONE will. Look at Tamilians. Do they EVER apologize or blame themselves for the HORRENDOUS CRIMES they did? NO. They maintain they were ALWAYS right. This is the RIGHT propaganda strategy. Agree : “Look at Tamilians. Do they EVER apologize or blame themselves for the HORRENDOUS CRIMES they did? NO”. Too true. The few brave Tamil leaders who spoke about the truth of the situation were killed by the ltte. * It were the Tamils who had it good under the British Colonial system, never the Sinhala people. In the ‘divide & rule’ method the British employed, the Tamils of that time scored. Though a sector of low caste Tamils were used as Labor in the tea estates, it were the Tamils who were educated to do the administration in Sri Lanka. The Sinhala majority kept off the invaders administrative structure, learning of English, attending their school by converting to Christianity, etc. except for a handful of Sinhala people. Hence the JVP formed partly due to Cold War politics too. Colonists ignore the welfare of the rural poor of the colonized. The damage done still reverberates. * Tamil Labor brought into Sri Lanka (One and a half MILLION by the the Dutch first and British later), brought in their Caste system plus the Tamil Language. The worst part was that TAMIL ILLEGAL MIGRANTS could then enter Lanka very freely and this became a habit. JRJ govt. recognised this problem and tried to stop it with partial success. These problems too still reverberate in Lanka. Today Upcountry Tamils are loyal to India (Tamil Nadu) connected through the Tamil language & Hindu religion, perhaps more than to Sri Lanka ? * As far as I know, the only seemingly fair play item that the Brits allowed the Sinhala people was that Tamil language was not made to be on par with the Sinhala language (Lorenzo, as you say, Tamil appeal to Soulbury failed). All the rest of it was in FAVOR of minority Tamils. This was, I believe, done not out of fair play, but to maintain the status of the English language vis a vis the Tamil language. The British renegaded on the promise made to let Buddhism be the prime religion of Lanka during their reign. * The method of gaining Goals differ in the two ethnic groups. One takes (Tamils) through any means available, and the other gives (Sinhala), with Buddhism as their reference point. * Sinhala people should ALWAYS bear in their minds that the British took over Sri Lanka with relative ease because of Sinhala dissent in the Upcountry. This is the second most IMPORTANT of lessons from the past. Sinhela people must by now have realised that dissent must be tackled through in wiser ways, through discussion & debate. Tamils are repeating the same mistake as the Sinhela people, trying to bring in foreign powers into Lanka to solve their internal problems. It will never work. Actions of neo-colonists will be the same as colonists. The first lesson is : NEVER be Colonised again. Above comments made in the spirit of truth of matters, and looking for mutually beneficial solutions for both the Sinhela and Tamil communities in order that we may live in some relative peace together. The LONG term solution is SINHALISATION of SL. NOT maintaining two language systems. English is OK as a link language internally and externally. IF Tamil speaking Muslims want to have ARABIC in SL we must support it. Wasn’t ” Sinhalozation” of Sri Lanka tried once in the not too distant past by Mm Sirimavo and what did it visibly do but set the country back decades as the complexities of the Sinhala language did not gel with the international community and the university by products were a pathetic example of what the country did not need towards its image nor were they able to face the world and communicate appropriately without translators hanging around them.The English language can never be brushed aside on the basis of Sinhala as the main official language although it is more a show of patriotism which despite its importance did the country no favours in a corporate or industrial sense.The Sinhala Only era in the minds of many were an aberration of the norm that even disrupted the Education system eg Medical and Engineering Studies in Sinhala Only a drudgery for the best of students! although the graduates presented an amazing degree of adaptation to the circumstances which demanded it. It is a blessing perhaps in disguise that today the importance of English has restored the nation to a greater credibility from many perspectives as well as on the world platform while the role of the Sinhala language as the language of the people has remained intact and flourishes in its own unique realm by way od usage and applivcation in all official matters and otherwise. Wasn’t there a mandatory Sinhala proficiency exam for public servants one time?and now also one for Tamil?which has no bearing on this mpresent issue and somewhat contentious also based on the popi=ulation ratio of Sinhala and Tamil. If Tamil speaking Muslims want Arabic they should denounce their citizenship and domicile themselves in an Arabic environment perhaps and not demand it in Sri Lanka! Moral of story~ In Sri Lanka the official Language should be that of the majority where all other languages need to be respected but not granted officialdome where English remains the universal link. It would be good to have Sinhala Language as the main language of the country, with English as a strong link language to all other communities in Sri Lanka as well as the rest of the world. Tamil can be a language for official purposes. Arabic ? not wise. Though using the English language, that does not mean we have to be servile to ex-Colonists. They did not treat the bulk of people of Lanka well at all, wealthy or poor, and used the country for gain of Colonial power. English – ALL should know it. Arabic and Tamil – national languages only. IF Tamil can be a national language and an ILLEGAL OFFICIAL language, I don’t know why NOT Arabic. Muslims are classified as Tamil speaking by Tamilians. Making their total 25%. A LARGE minority. But if Arabic can be introduced then Tamil speaking 15%. Arabic 10%. Two SMALLER minorities. Divide and rule. IF SLs know MORE Arabic that helps them in getting more jobs and making more money in Arabic countries (BIGGEST money earner for SL). Knowing Tamil is USELESS. This entry was posted on Saturday, August 17th, 2013. You can follow any responses to this entry through the RSS 2.0 feed. You can skip to the end and leave a response.